Good Morning, I am still one of those silly giraffe watchers and we are still waiting lol…. Meanwhile I have noticed an interesting trend here in my small little piece of forest. I have a lot of pairs. I started to list them and began to laugh that so many are right here in that header picture I have for my backyard…It so funny I have Chuck and Lilly again the mallard ducks, I wake up to find Chuck on the roof of our cabana and Lilly eating away at the same spot as the bunnies. Speaking of bunnies I also have a pair living here in the yard, My Crow (Harriet is building nest here again and eating suet which means babies). Buster the douglas squirrel, the Pileated , Hairy and Downy woodpeckers (aka woody and mamma, Big and Little Ricky and Lucy lol. ) The Flickers I call pretty bird, and I even have a yellow-bellied that I call Blondie (she is new this year) Chip and Dale the chipmunks are again in their house out back, The band tailed pigeon (Bandit and Mrs B), The morning dove (I have one that is no longer skittish) which is a bit of a problem since I saved it from a cat last night !!! Pair of bald eagles that have a nest nearby, and the red-tailed Hawk is a pair along with the Coopers Hawk (he is my biggest pain) I only say that because he is a sneaky bugger! Found out Pokie the opossum has found a way under our back shed. I’m checking to see if there are babies before I move her out. I also have 4 white-tailed deer since momma had 2 fawns (twins) hooray!! I sure I’m missing some but that is a pretty good idea. The amazing part to me is this is all in my little backyard and it’s getting even more popular and its making the circle of life even more interested in my sanctuary. Now we are getting the coyotes , Bobcats , eagles etc that make it tricky to put out feed. 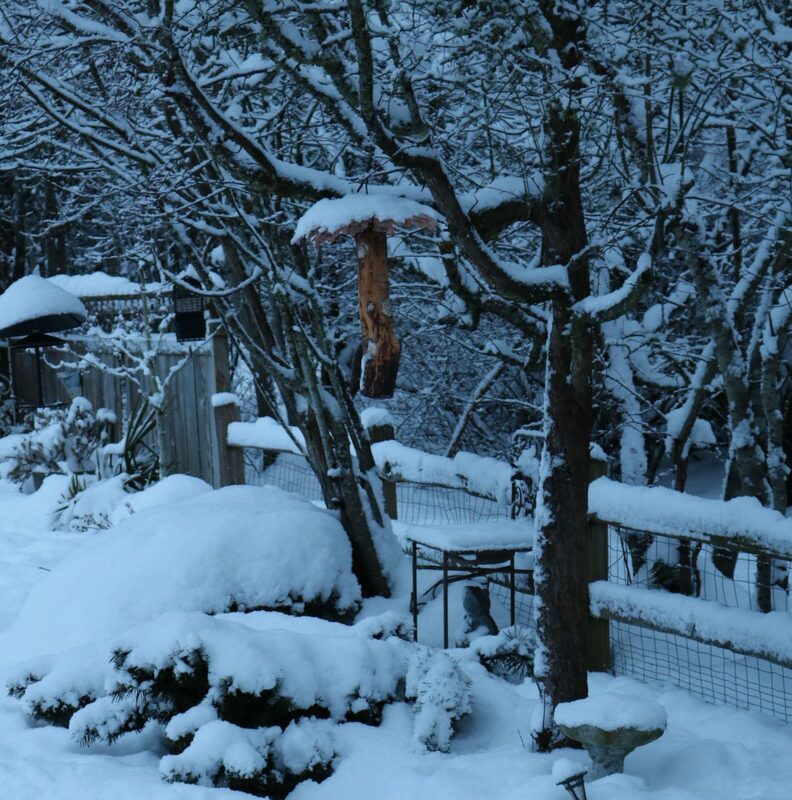 I am now picking different routines because I caught the hawk sneaking in the tree at the crack of dawn while I put out feed hoping not to be seen…. he apparently figured out the feeding times and was taking out my squirrels and dove, so I switch it up hoping to get them to hunt elsewhere.